Take Advantage of How the Brain Learns Best! Signing Songs and Fingerspelling Accelerates Early Literacy Skills. Signing songs and manual fingerspelling engage the whole child in joyful learning. They add a kinesthetic memory connection for acquiring new skills and develop the small muscles necessary for writing. Singing and signing is multisensory; it combines “saying and doing,” which increases retention of new information and understanding of language concepts up to 90 percent. Research shows that learning sign language builds confidence and enthusiasm for learning. Reading the three-dimensional language of sign also develops visual skills for reading printed language. High academic standards are met most easily when children are engaged and motivated. Enriching children’s literacy experiences by signing familiar songs encourages teachers and parents to become learners right along with their children. As an added bonus, children usually learn to sign songs more easily than adults, much to their delight! Learning Sign Language is a Life Skill. Not only does learning American Sign Language (ASL) give children enhanced literacy skills, but it also provides them with an important life skill for communication. ASL is the third most commonly used language in the United States! Proficiency in a second language is a requirement for high school and college graduation, and the optimum age to acquire a new language is during early childhood. Additional language acquired while the child is young enhances their communication skills throughout life. This is especially true of learning the emotionally rich American Sign Language. New language connections in a child’s brain will develop much more quickly through song, as the child communicates whole sentences and phrases rather than isolated words. Singing and Signing Enhance Speaking Skills. Young children who are fortunate enough to learn ASL through accelerated language learning with songs at home, in preschool, and in kindergarten have an early advantage in developing expressive, dynamic speaking skills. Singing and Signing Makes Learning to Recognize and Spell Words Easier. Kindergarten teachers have discovered that singing and signing builds success for “word work” activities and spelling by making learning auditory, kinesthetic, social, and fun! Most young children first become auditory spellers; they become visual spellers later. By nature, children love to move their bodies. Children’s memory for the spelling sequence of words is dramatically improved through singing, signing, and fingerspelling. 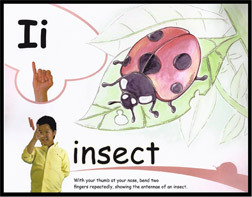 They can use fingerspelling more easily and quickly than they can print letters. Kinesthetically forming letters with the fingers dramatically improves recall of letters, especially for the hardest-to-reach children. Signing Songs Accelerates ABC and Phonics Skills. ABC and Phonics Immersion through sign language and song has been shown to greatly accelerate the learning of the alphabetic principal, especially for the hardest-to-reach children. Early mastery of these foundational skills is vital to ensure literacy success for all children. Singing and signing allows us to provide multisensory instruction that is simply more memorable and joyful for young learners. In other words, it is “kid friendly.” Children quickly learn letters and sounds with ABC Sing, Sign, and Read! 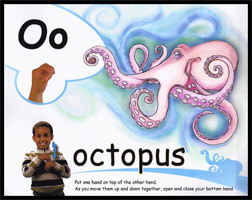 The kinesthetic motion of fingerspelling a letter and then signing the key word triggers a response that will help children recall the corresponding sound. 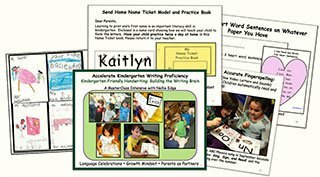 It places explicit, systematic phonics instruction within a rich language learning experience that simultaneously enhances fluency, comprehension skills, and vocabulary. These powerful first teaching strategies are designed to prevent early literacy difficulties and bridge the achievement gap. Group Singing and Signing is a Satisfying Social Experience. Choral singing, signing, and reading are satisfying social experiences in which every child will a sense of belonging and perceive themselves as successful. When children are singing and signing, they are joyful, focused, and engaged – the optimum state for language learning. They acquire language fluency while having the magical “I can read” experience. Skills instruction is accelerated because it is multisensory and placed in a meaningful context that strengthens a child’s capacity for listening, speaking, and self-regulated learning behavior. Children’s Experience in Learning to Read Generalizes to Their Whole Self-Concept. Bruno Bettleheim’s research reminds us that how children perceive themselves in the act of learning to read generalizes to their whole self-concept. When teachers engage their students in multisensory literacy through signing familiar songs, the motivation, pleasure, and success they feel not only supports them in learning to read, but also allows them to see themselves as successful individuals who are passionate about learning. These are the positive attitudes that will allow children to begin reaching high Common Core Standards in literacy and beyond.